Added chiseled armor rendering for Evokers. Included JEI's Translator and CycleTimer classes in EBM, rather than directly referencing them. All credit to mezz. Fixed bug where offset shapes could not be placed in local mode. Fixed bug where rectangular pyramids could not be drawn when facing in a negative axial direction. Updated Forge and JEI references to fix broken JEI integration. Added sculpting shape placement offset mode for spades. 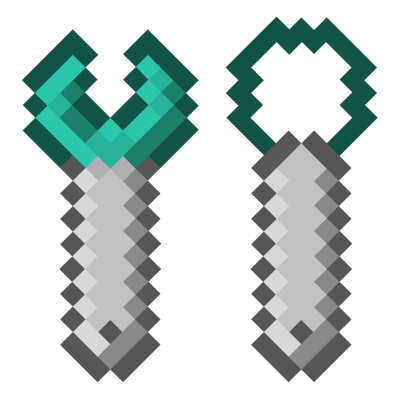 Added JEI info pages for sculpting and modeling, and description pages for bit tools, throwing bits, and editing chisel designs. They can also be deployed from vanilla dispensers. Upon block collision, they place in the world, if possible. If not possible (or if thrown at entities) they drop as items. If not disabled via config, bits with a martial of lava ignite blocks/entities and bit with a martial of water extinguish them. The damage amount, entity burn time (for lava bits), velocity, and inaccuracy of thrown bits are also configurable. Client-server desync no longer occurs. There is no longer a prominent flash of transparency as blocks convert to chiseled blocks. There is no longer a potential for all blocks to become transparent until the client is restarted. Fixed bug where pressing the C&B radial menu key would crash if bound to non-standard key. Fixed potential for NPE when finding random points in blocks to spawn bits in. Fixed bounding box rendering bug with wires in local mode. Removed framerate-dependence of Bit Wrench overlay mirror/rotation/translation periods by using a stopwatch and setting their configs to milliseconds per cycle, rather than frames per cycle. Replaced use of GL stencil buffer with GL scissors in the bit mapping GUI. Remedied situation where other mods register diamond nuggets with the ore dictionary but don't add easily obtainable recipes for them (accomplished by registering with the ore dictionary and adding the recipes of 9 nuggets to a diamond and vice versa regardless of whether other mods do so), but added configs for disabling all three (defaults set to false).